An action adventure based on the japanese comic book with the same name by Kentaro Miura. Upon release, this game was a surprise for the readers of the comic, as the story takes place later than the current graphic novels had reached at the time. The story is a complete side story written by Miura, and takes place during the "Millennium Falcon" arc. The subtitle "Wasurebana no sho" means "the chapter of the Forgetful Flowers". 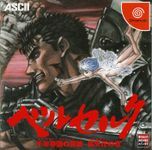 In this game, Gatts (or Guts) comes to a town and is asked to help the town from the cursed Mandragora flower, that infects people, turning them into monsters. In return, the town elder promises to try to cure Caska from her madness. The voice actors in the Japanese version are the same as in the anime. The music is written by Susumu Hirasawa, and the main title and end title feature version of the song "Forces", especially written for the Dreamcast game.